Stress is perfectly normal. Clients often tell me that their goal is to never feel stressed again. As stress has many benefits, it’s important that I work closely with the client to establish exactly the situation in which they feel the stress. After a lot of questioning the client will often discover that it isn’t something that they need to ‘get rid of’ but rather they want to manage their reaction to it. You may have noticed that at times being ‘stressed out’ can actually motivate you to focus clearly on your work. Think of those times at work, the day before you take your annual vacation when you are trying to get everything completed. That increased speed and focus is a as a result of stress. Yet there are other times when stress can completely overwhelm us; where we become almost paralysed and unable to make a decision or take action. Let’s look in a little more detail at the benefits and side effects of stress as well as how to tell if you’re experiencing too much stress. Stress is actually a burst of energy to advise us on what to do. Why not listen to it? Hear what it is telling you? If we don’t fight it, we can hear important messages and change how we react. There are definite advantages to these small bursts of energy; for example, they can increase our motivation to deal with daily challenges. Stress can help us to accomplish tasks more efficiently and has even been shown to give our memory a boost. One of the main functions of stress, of course, is to act as an early warning system. Stress produces the fight or flight response. This is where our brain perceives some threat and begins to flood the body with chemicals such as epinephrine, norepinephrine and cortisol. The body has a number of reactions to these chemicals, such as, increased heart rate and an increase in blood pressure. Also, our senses suddenly become much more focussed. In fact, it’s this focus of the senses that enables us to physically avoid threats to our wellbeing such as jumping out of the way of a car, moving us to a safer location. There has been a vast array of studies looking into the health benefits of a ‘little bit of stress’. There is a belief that some stress can help strengthen our immune system; improve how our heart works; protect our body from infection and even help us recover more quickly from surgery. My invitation to you is that the next time you feel stressed, take a breath and notice whereabouts in your body you feel the stress; what is the feeling; what else do you notice about what is happening in your body and mind. The first step to managing our reaction to stress is to become more aware of when it happens. 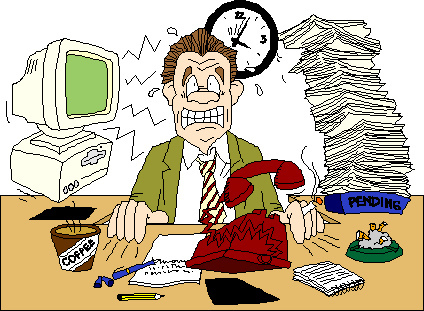 Stress that stays around for weeks or even months can cause us significant damage. Our immune system can weaken, our blood pressure can remain high and it can lead to chronic fatigue, depression, anxiety and even heart disease. When we become overwhelmed with stress and that fight or flight response doesn’t actually switch off, then we can lose our focus. When this happens, we can lose our ability to make logical and rational decisions. This is simply because when fight or flight is activated, our brain will shut down other elements of itself that are not required in this state. To put it simply, the emotional and logical elements of the brain aren’t necessary when you are running away from a lion! Unable to concentrate on or complete a task. Picking up more colds than usual. More aches and pains in the body than usual. Finding it hard to fall asleep or waking up a lot during the night. Feeling more angry or anxious than usual. Being stressed can be a learned behaviour too. We get used to feeling a certain way in a particular situation and our brain automates the process. If we can learn it, we can unlearn it. In my next blog I will be looking at ways in which we can help ourselves de-stress.